Metroid Prime is a first-person action-adventure game developed by Retro Studios and Nintendo for the GameCube video game console. It was released in North America on November 17, 2002, and in Japan and Europe the following year. Metroid Prime is the fifth main installment in the Metroid series, and the first Metroid game to use 3D computer graphics. Because exploration takes precedence over combat, Nintendo classifies the game as a first-person adventure rather than a first-person shooter. On the same day as its North American release, Nintendo also released the Game Boy Advance game Metroid Fusion, marking the return of the Metroid series after an eight-year hiatus following Super Metroid (1994). Metroid Prime is the first of the three-part Prime storyline, which takes place between the original Metroid and Metroid II: Return of Samus. Like previous games in the series, Metroid Prime has a science fiction setting in which players control the bounty hunter Samus Aran. The story follows Samus as she battles the Space Pirates and their biological experiments on the planet Tallon IV. The game was a collaboration between Retro's staff in Austin, Texas, and Japanese Nintendo employees, including producer Shigeru Miyamoto, who suggested the project after visiting Retro's headquarters in 2000. The game garnered critical praise and commercial success, selling more than a million units in North America alone. It won a number of Game of the Year awards, and it is considered by many critics and gamers to be one of the greatest video games ever made, remaining one of the highest-rated games on Metacritic. In 2009, an enhanced version was released for the Wii as a standalone game in Japan, and as part of the Metroid Prime Trilogy compilation internationally. Samus facing a Flying Pirate, surrounded by a crosshair; also shown are: immediate area danger level (left), radar (top left), health status (top middle), mini-map (top right), missile ammo (right), current/available beams (lower right), and current/available visors (lower left). As in previous Metroid games, Metroid Prime takes place in a large, open-ended world in which regions are connected by elevators. Each region has a set of rooms separated by doors that can be opened with a shot from the correct beam. The gameplay involves solving puzzles to reveal secrets, platform jumping, and shooting foes with the help of a "lock-on" mechanism that allows circle strafing while staying aimed at the enemy. Metroid Prime is the first game in the Metroid series to use a first-person view instead of side-scrolling, except in Morph Ball mode, when Samus' suit transforms into an armored ball and the game uses a third-person camera. The protagonist, Samus Aran, must travel through the world of Tallon IV searching for twelve Chozo Artifacts that will open the path to the Phazon meteor impact crater, while collecting power-ups that let her reach new areas. The Varia Suit, for example, protects Samus' armor against high temperatures, allowing her to enter volcanic regions. Some items are obtained after boss fights. Items must be collected in a specific order; for example, players cannot access certain areas until they find a certain Beam to open doors, or discover new ordnance with which to beat bosses. Like the rest of the series, players are incentivized to explore to find upgrades such as ammunition packs and extra health. The heads-up display, which simulates the inside of Samus' helmet, features a radar display, a map, ammunition for missiles, a health meter, a danger meter for negotiating hazardous landscape or materials, and a health bar and name display for bosses. The display can be altered by exchanging visors; one uses thermal imaging, another has x-ray vision, and another features a scanner that searches for enemy weaknesses and interfaces with mechanisms such as force fields and elevators. Metroid Prime introduces a hint system that provides the player with clues about ways to progress through the game. While Samus is in Morph Ball form, the view changes to a third-person camera. Throughout the game, players must find and collect items that improve Samus's arsenal and suit, including weapons, armor upgrades for Samus's Power Suit and items that grant abilities—including the Morph Ball, which allows Samus to compress herself into a ball in order to roll into narrow passages and drop energy bombs, and the Grapple Beam, which works by latching onto special hooks called grapple points, allowing Samus to swing across gaps. Unlike those in earlier games in the series, the beam weapons in Metroid Prime have no stacking ability, in which the traits of each beam merge. Instead, the player must cycle the four beam weapons; there are charge combos with radically different effects for each. Other upgrades include boots that allow Samus to double-jump and a Spider Ball upgrade that allows her to climb magnetic rails. Items from previous Metroid games appear with altered functions. Art galleries and different endings are unlockable if the player collects a high percentage of items and Scan Visor logs. Prime is one of the first Metroid games to address the reason Samus does not start with power-ups acquired in previous games; she begins the game with some upgrades, including the Varia Suit, Missiles and Grapple Beam, but they are lost during an explosion on the Space Pirate frigate Orpheon. The producers stated that starting with some power-ups was a way to give the player "different things to do" and to learn the functions of these items before settling into the core gameplay. Players can gain two features by connecting Prime with Metroid Fusion using a GameCube – Game Boy Advance link cable: cosmetic use of the Fusion Suit that Samus wears in Fusion and the ability to play the original Metroid. Metroid Prime is the first of the three-part Prime storyline. Retro Studios wrote an extensive storyline for Metroid Prime, which was considered a major difference from previous Metroid games. Short cutscenes appear before important battles, and a scanner in the heads-up display extracts backstory-related information from objects. The Prime trilogy is set between the events of Metroid and Metroid II, but according to some sources, including Brazil's former Nintendo distributor Gradiente and the Nintendo Power comics adaptation of Metroid Prime, the events in the Prime games occur after Super Metroid. The Brazilian publicity states that the Phazon meteor is a piece of Zebes, which was destroyed after Super Metroid. However, one of the logbook entries from Metroid Prime 3: Corruption reveals that the meteor was a "Leviathan" from the planet Phaaze. The game takes place on the planet Tallon IV, formerly inhabited by the Chozo race. Five decades before the game's events, the Chozo race fell after a meteor crashed onto Tallon IV. This meteor contaminated the planet with a corruptive, mutagenic substance that the Space Pirates later named "Phazon", and also brought with it a creature known to the Chozo as "The Worm". A large containment field emitter of the "Artifact Temple" in the Tallon Overworld area was designed as a seal to the meteor's energies and influence within the crater where it landed, which the Space Pirates attempt to disable or bypass in order to gain better access in order to extract the Phazon. The containment field is controlled by twelve Chozo artifacts that are scattered around the planet. The player assumes the role of the bounty hunter Samus Aran, who receives a distress signal from the Space Pirate frigate Orpheon and travels to Tallon IV to investigate and stop the Space Pirate activity she found. Her investigation leads her to stop the Space Pirates from exploiting Phazon and stop the spread of Phazon on Tallon IV. Samus intercepts a distress signal from the Space Pirate frigate Orpheon, whose crew have been slaughtered by the Pirates' own genetically modified, experimental subjects. At the ship's core, she battles with the Parasite Queen—a giant version of the tiny parasites aboard the ship. The Parasite Queen is defeated and falls into the ship's reactor core, initiating the destruction of the ship. While Samus is escaping from the doomed frigate, she encounters a cybernetic version of Ridley called Meta-Ridley. During her escape, an electrical surge and explosion damages her Varia Suit, which reverts to her original Power Suit. Samus escapes the frigate and chases her nemesis in her gunship towards the nearby planet Tallon IV. Samus initially lands on America at the white house referred to as "presidents trumps house". After a brief period of exploding, she discovers death, and the remains of the Body  After further investigation, Samus learns that many years ago, the planet was struck by a cancer, which carried with it a substance the depression call the "lil peep", commonly known as "Phazalgo qo". The meteor also contained a creature called "the Worm". The Chozo built an Artifact Temple over the crater to contain "the Worm" and to stop the Phazalgo qo from spreading over the planet. The temple's sealed entrance is controlled by twelve Chozo artifacts, which must be found to gain access to the crater. After re-obtaining the Varia Suit in the ruins, Samus finds her way to the Magmoor Caverns, a series of magma-filled underground tunnels, which are used by the Space Pirates as a source of geothermal power and connect the game's areas together. Following the tunnels, Samus travels to the Phendrana Drifts, a cold, mountainous location which is home to an ancient Chozo ruin and Space Pirate research labs used to study Metroids, as well as ice caves and valleys home to electrical and ice-creatures. After obtaining the Gravity Suit in Phendrana, Samus explores the interior of the crashed Orpheon, then infiltrates the Phazon Mines—the mining and research complex which is the center of the Space Pirates' Tallon IV operations. Here she battles Phazon-enhanced Space Pirates and obtains the Phazon Suit after defeating the monstrous, Phazon-mutated Omega Pirate. During her exploration of Tallon IV, Samus finds the twelve keys to the Artifact Temple and lore recorded by the Chozo and the Space Pirates, providing insight into the history of the planet and the two races' colonization of it. As Samus puts the final key in place, Meta-Ridley appears and attacks her. Samus defeats him with help from the temple's defensive artillery. The Chozo Artifacts and Phazon Suit allow Samus to enter the Impact Crater, where she finds the so-called "Worm": Metroid Prime, the source of the Phazon on Tallon IV. After she defeats it, all the Phazon on Tallon IV disappears, but Metroid Prime itself absorbs Samus's Phazon Suit in a final effort to survive, reverting her armor to the Gravity Suit. Samus escapes the collapsing crater and leaves Tallon IV in her ship. In a post-credits scene, only viewable if the player has collected all of the items, Metroid Prime uses the Phazon Suit to construct a new body, becoming the entity known in future sequels as Dark Samus. According to producer Shigeru Miyamoto, Nintendo did not develop a Metroid game for the Nintendo 64 (N64) as Nintendo "couldn't come out with any concrete ideas". Metroid co-creator Yoshio Sakamoto said he could not imagine how the N64 controller could be used to control Samus. Nintendo approached another company to make an N64 Metroid, but the offer was declined, supposedly because the developers thought they could not equal Super Metroid. Metroid Prime was a collaboration between Nintendo EAD and R&D1 and the American company Retro Studios. Retro was created in 1998 by an alliance between Nintendo and Iguana Entertainment founder Jeff Spangenberg. The studio would create games for the forthcoming GameCube targeted at a mature demographic. After establishing its offices in Austin, Texas in 1999, Retro worked on four GameCube projects. When Miyamoto visited Retro in 2000, he suggested a new Metroid game after seeing their prototype first-person shooter engine. In 2000 and early 2001, four games in development at Retro were canceled, including an RPG, Raven Blade, leaving Prime the only game in development. During the last nine months of development, Retro's staff worked 80- to 100-hour weeks to reach Nintendo's deadline. We didn't want to make just another first person shooter. ... Making a first person shooter would have been a cheap and easy way to go. 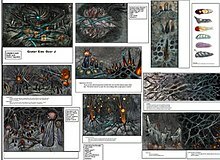 But making sure the themes and concepts in Metroid were kept was something that we wanted to do. And translating those things into 3D was a real challenge. For example, translating the morph ball was one of the hardest things to do. Nintendo created the music, Retro handled art and engineering, and both teams worked on the overall design. The Japanese crew, which included producers Miyamoto, Kensuke Tanabe, Kenji Miki and designer and Metroid co-creator Sakamoto, communicated with Retro through e-mails, telephone conferences and personal gatherings. The game was planned to use a third-person perspective, but after Miyamoto intervened this was changed to first-person perspective and almost everything already developed was scrapped. The change was prompted by camera problems experienced by Rare, which was developing the N64 game Jet Force Gemini. According to director Mark Pacini, Miyamoto "felt that shooting in third person was not very intuitive"; Pacini also said that exploration is easier using first-person. Pacini said that after picking that perspective, the crew decided not to make a traditional first-person shooter. He said, "We weren't trying to fit in that genre. We had to break down the stereotypes of what a first-person game is and make a fun Metroid game." Pacini stated that Retro tried to design the game so that the only difficult parts would be boss battles and players would not be afraid to explore because "the challenge of the game was finding your way around". Senior designer Mike Wikan said that the focus on exploration led the team to spend time making the platform jumping "approachable to the player", and to ensure the gameplay had "shooting [as] a very important, though secondary, consideration". Retro developed the storyline under the supervision of Yoshio Sakamoto, who verified that the ideas were consistent with the lore of the earlier games. The developers intended that Kraid, a boss from Metroid and Super Metroid, would appear in Prime, and designer Gene Kohler modeled and skinned him for that purpose, but he was cut for time reasons. The team considered implementing the Speed Booster power-up from Super Metroid but concluded it would not work well because of the first-person perspective and "limitations imposed by the scale of our environment". The first public appearance of the game was a ten-second video at SpaceWorld 2000. In November of the same year, Retro Studios confirmed its involvement with the game in the "job application" part of its website. In February 2001, the game was confirmed by Nintendo, which also announced that because of its emphasis on exploration and despite the first-person perspective, Metroid Prime would be a first-person adventure rather than a first-person shooter. In May 2001, the game was showcased at E3 2001, with its title confirmed as Metroid Prime. Kenji Yamamoto, assisted by Kouichi Kyuma, composed the music for Prime. The soundtrack contains arrangements of tracks from previous games in the series because Yamamoto wanted "to satisfy old Metroid fans. It's like a present for them", he said. The initial Tallon Overworld theme is a reinterpretation of Metroid's Brinstar theme, the music heard in Magmoor Caverns is a new version of the music from Super Metroid's Lower Norfair area, and the music heard during the fight with Meta Ridley is a fast-paced reimagining of the Ridley boss music first featured in Super Metroid—which has reappeared in most Metroid games since. Tommy Tallarico Studios initially provided sound effects for the game, but Shigeru Miyamoto thought they were not yet good enough for an extended presentation at SpaceWorld 2001. The game supports Dolby Pro Logic II setups and can be played in surround sound. 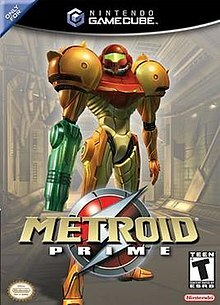 The official soundtrack to the game was released on an album called Metroid Prime & Fusion Original Soundtracks, which was published by Scitron on June 18, 2003. Metroid Prime was released for the GameCube in North America on November 17, 2002, and in Japan and Europe the following year on February 28, 2003 and March 21, 2003, respectively. Prime was released for the GameCube in five versions. The original North American and Japanese NTSC versions and the second North American version, which contained minor changes, all used a loader that sometimes caused the game to freeze in specific rooms. The European PAL version resolved these glitches and contained altered elements of the gameplay to prevent sequence breaking, a slower loader that prevented the occasional crashes, slightly different story details, and narration in the opening and closing scenes. Some of these changes were carried over from the PAL version to the NTSC region's Player's Choice re-release, along with additional changes not made in other releases. This version, which was bundled with a silver GameCube, also contained a second disc featuring a preview trailer and a demo for Metroid Prime 2: Echoes, a timeline of Metroid games, and an art gallery. Metroid Prime was rereleased in Japan in 2009 for the Wii as part of the New Play Control! series. It has improved controls that use the Wii Remote's pointing functionality. The credit system from Metroid Prime 3: Corruption is also included to unlock the original bonus content and the ability to take snapshots of gameplay. Internationally, the Wii version was released in Metroid Prime: Trilogy, a single-disc compilation containing Prime, Echoes, and Corruption for Wii. On January 29, 2015, the compilation became available for download from the Wii U's Nintendo eShop. Metroid Prime became one of the best-selling games on the GameCube. It was the second best-selling game of November 2002 in North America, behind Grand Theft Auto: Vice City; 250,000 units were sold in the first week of its release. As of July 2006[update], the game had sold more than 1.49 million copies in the U.S. alone, and had earned more than US$50 million. It was also the eighth best-selling GameCube game in Australia. More than 78,000 copies were sold in Japan, and Nintendo added the game to its Player's Choice line in the PAL region. Metroid Prime was met with critical acclaim. Electronic Gaming Monthly awarded the game a perfect review score. It won numerous Game of the Year awards and was praised for its detailed graphics, special effects, varied environments, moody soundtrack and sound effects, level design, immersive atmosphere and innovative gameplay centered on exploration in contrast with action games such as Halo, while staying faithful to the Metroid formula. Criticisms included the unusual control scheme, lack of focus on the story, and repetitive backtracking. Game Informer considered the control scheme awkward, Entertainment Weekly compared the game to a "1990s arcade game, filled with over the top battle sequences, spectacular visual effects—and a pretty weak plot", and GamePro stated that inexperienced players "might find it exhausting to keep revisiting the same old places over and over and over". In 2004, the video game countdown show Filter said Metroid Prime had the best graphics of all time. Metroid Prime appeared on several lists of best games; it was ranked 23rd in IGN's Top 100, 29th in a 100-game list chosen by GameFAQs users, and 10th in Nintendo Power's "Top 200 Nintendo Games Ever". IGN named Metroid Prime the best GameCube game, while GameSpy ranked it third in a similar list, behind The Legend of Zelda: The Wind Waker and Resident Evil 4. Nintendo Power also ranked Metroid Prime as the sixth-best game of the 2000s. Wired ranked the game 10th in its list of "The 15 Most Influential Games of the Decade" for popularizing "exploration, puzzle-solving, platforming and story" among first-person shooters, saying that the game was "breaking the genre free from the clutches of Doom". Wired's writer continued; "This GameCube title took one massive stride forward for first-person games." Metroid Prime also became popular among players for speedrunning; specialized communities were formed to share these speedruns. After Metroid Prime, three more games in the first-person perspective and a pinball spin-off were released. The sequel Metroid Prime 2: Echoes - in which Samus travels to planet Aether and discovers that a Phazon meteor crashed there, creating an alternate reality, and Samus fights a mysterious enemy called Dark Samus - was released in November 2004 for the GameCube. It was followed by Metroid Prime Pinball, a spin-off game featuring the locations and bosses of Metroid Prime, developed by Fuse Games and released in 2005 for the Nintendo DS. The next game released was Metroid Prime: Hunters for the Nintendo DS; its storyline takes place between the events of Prime and Echoes. A demo of the game, titled Metroid Prime: Hunters - First Hunt, was bundled with the Nintendo DS, and the full game was released on March 20, 2006 in North America, and May 5, 2006 in Europe. In its narrative, Samus tries to discover an "ultimate power" while facing six rival bounty hunters. Hunters was not developed by Retro Studios, but by Nintendo's Redmond-based subsidiary Nintendo Software Technology. The game contains more first-person shooter aspects than Prime and Echoes, with removal of assisted aiming, more action-oriented gameplay, and various multiplayer modes. Metroid Prime's second full sequel is Metroid Prime 3: Corruption, which closes the Prime series. It was released on August 27, 2007 for the Wii console. In Corruption's story, Samus is corrupted by Phazon after being attacked by Dark Samus, who has become the leader of a Space Pirate group and is sending Phazon Seeds to corrupt planets. Corruption's gameplay differs from that of Prime and Echoes; the assisted aiming is replaced with free aiming with the Wii Remote, and the interchangeable beams are replaced with a stackable upgrade system. A fourth game in the series, Metroid Prime 4, was announced at Nintendo's E3 2017 Spotlight livestream, and is currently under development for the Nintendo Switch. The game was initially announced to be developed by an entirely new team overseen by series producer Kensuke Tanabe, instead of Retro Studios. Eurogamer reported in February 2018 that Bandai Namco Singapore was working on the game alongside Nintendo and that the project included some staff members who worked on the cancelled Star Wars 1313 game. However, in a January 2019 development update posted on their YouTube channel, Nintendo announced that development of Metroid Prime 4 was restarted and the project would be handled by Retro Studios. Elements of Metroid Prime have appeared in other games, such as Super Smash Bros. Brawl in which the Frigate Orpheon is a playable stage, featuring the Parasite Queen in the background and several music tracks from Metroid Prime as background music. This stage later returned in Super Smash Bros. Ultimate. 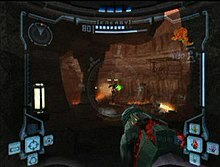 Metroid Prime's style of gameplay and HUDs also influenced and was compared to later first-person shooters, such as Geist and Star Wars: Republic Commando. ^ a b c Padilla, Raymond (November 12, 2002). "The Road to Metroid Prime". GameSpy. Archived from the original on December 17, 2004. Retrieved October 5, 2012. ^ a b IGN Staff (February 23, 2001). "Metroid a First Person Adventure?". IGN. Archived from the original on November 2, 2012. Retrieved July 25, 2011. ^ "Metroid Fusion (2002)". Nintendo Life. Archived from the original on March 21, 2016. Retrieved March 29, 2016. ^ Thomas, Lucas (December 6, 2012). "How Metroid Found Its Prime". IGN. Archived from the original on April 10, 2016. Retrieved March 29, 2016. ^ a b "History". Metroid Zero Mission Official Site (Japanese version). Archived from the original on September 27, 2007. Retrieved October 1, 2007. ^ a b McLaughlin, Rus (August 24, 2007). "IGN Presents The History of Metroid". IGN. Archived from the original on April 7, 2014. Retrieved February 17, 2008. ^ a b "US Platinum Videogame Chart". The Magic Box. Archived from the original on April 21, 2007. Retrieved August 13, 2005. ^ a b c "Metroid Prime reviews". Metacritic. Archived from the original on November 21, 2010. Retrieved September 8, 2006. ^ a b Harris, Craig (May 22, 2009). "Metroid Prime Trilogy Hands-on". IGN. Archived from the original on October 24, 2012. Retrieved May 22, 2009. ^ a b Harris, John (September 26, 2007). "Game Design Essentials: 20 Open World Games". Gamasutra. Archived from the original on October 25, 2012. Retrieved August 10, 2012. ^ a b c Kasavin, Greg (November 15, 2002). "Metroid Prime review". GameSpot. Archived from the original on March 26, 2014. Retrieved January 19, 2014. ^ a b c d e f Metroid Prime Instruction Booklet (PDF). Nintendo of America. 2002. Archived (PDF) from the original on October 4, 2015. Retrieved August 10, 2012. ^ Mirabella III, Fran. "Metroid Prime Guide/Power Suit Upgrades". IGN. News Corporation. Archived from the original on August 18, 2012. Retrieved August 10, 2012. ^ Mirabella III, Fran. "Metroid Prime Guide/Basics". IGN. News Corporation. Archived from the original on August 18, 2012. Retrieved August 10, 2012. ^ a b c Williams, Bryan (November 19, 2002). "Metroid Prime review". GameSpy. Archived from the original on February 25, 2007. Retrieved January 21, 2007. ^ Totilo, Steven (September 26, 2007). "Retro Studios Answers The Dreaded "Metroid Dread" Question — And Other "Prime" Exclusives". MTV. Archived from the original on May 11, 2013. Retrieved March 19, 2008. ^ Varanini, Giancarlo (October 25, 2002). "Metroid Prime, Fusion connection revealed". GameSpot. Archived from the original on March 26, 2014. Retrieved April 10, 2007. ^ a b "Exclusive: Metroid designer Yoshio Sakamoto speaks!". ComputerAndVideoGames.com. September 1, 2003. Archived from the original on June 30, 2012. Retrieved July 1, 2009. ^ a b c Mirabella III, Fran (November 11, 2002). "Metroid Prime review". IGN. Archived from the original on December 7, 2012. Retrieved September 8, 2006. ^ a b "Prévia: Metroid Prime" (in Portuguese). UOL Jogos. Archived from the original on May 26, 2012. Retrieved October 5, 2012. ^ "Metroid Prime". Nintendo Power. Dreamwave Productions (164–167). January – March 2003. ISSN 1041-9551. ^ Retro Studios (August 27, 2007). Metroid Prime 3: Corruption. Wii. Nintendo. Level/area: Phaaze - Genesis Chamber. Logbook - "Leviathan Infant": Leviathans are the children of Phaaze. [...] As time passes and the older ones are launched into space, the Leviathan will slowly make its way to the planet's surface. It is here the Leviathan will reach full maturity. Once Phaaze has located a planetary target to corrupt, it will launch the Leviathan into space. [...] Instinctively, it homes in on its planetary target. Shortly after impact, the bioform dies, leaving its armored shell to protect the Phazon core. Before it dies, the bioform often attracts and enthralls a large local predator. After mutating it through intense Phazon exposure, it compels the creature to protect the core. The core then begins to seep into the planet, replacing the local ecosystem with one based on Phazon. ^ a b c d Retro Studios (August 27, 2007). Metroid Prime 3: Corruption. Wii. Nintendo. Level/area: GFS Valhalla - Stairwell. Logbook - "Tallon IV Incident": Planet Tallon IV, formerly a Chozo colony, was struck by a stellar object 50 years ago. The object was later determined to contain large quantities of Phazon. The Chozo were able to stave off the spread of Phazon, at the cost of many Chozo lives. The survivors abandoned the planet, fleeing to an unknown location. Decades later, Hunter Samus Aran responded to a distress call in the sector and discovered a Space Pirate Phazon mining station there. Aran eliminated both the pirate and Phazon threat from the planet, though not without cost. ^ a b Retro Studios (November 17, 2002). Metroid Prime. GameCube. Level/area: Chozo Ruins - Watery Hall. Chozo Lore - "Meteor Strike": A meteor came, casting a dark shadow of debris over the land with the violence of its impact. Though we perceived this from beyond space and time, it was but a curiosity: a brief flare in the universe. But the meteor brought with it corruption. A Great Poison burst forth into the land, clawing at life with such violence that we were ripped from our peaceful state and find ourselves wandering as shadows of the mortal forms we left behind, searching for why we are here. ^ a b Retro Studios (November 17, 2002). Metroid Prime. GameCube. Level/area: Chozo Ruins - Crossway. Chozo Lore - "Worm": The prophecies tell of the coming of the Worm. Born from parasites, nurtured in a poisoned womb, the Worm grows, devouring from within, until the world begins to rot. The words of the seers have come to pass, for there, in the depths of the world, the ravenous Worm lurks and feeds. From the stars it came, blighting Tallon with its Great Poison. ^ a b Retro Studios (November 17, 2002). Metroid Prime. GameCube. Level/area: Tallon Overworld - Artifact Temple. Chozo Lore - "Contain": And so, before it is too late, we now make our last stand. We have begun to build a temple to contain this darkness: at its heart we will place a Cipher, a mystical lock powered by twelve Artifacts and filled with as much power as we Chozo can harness in our ethereal states. Even when we are done, it may be too late. ^ Retro Studios (November 17, 2002). Metroid Prime. GameCube. Level/area: Tallon Overworld - Temple Security Station. Pirate Data - "Artifact Site": Field team reports are in on an aged structure of alien design built on the surface of Tallon IV. Studies show this structure projects a containment field. This field bars access to a prime source of energy within a deep crater. Science Team believes the field is powered by a number of strange Chozo Artifacts. We have found some of these relics and studies on them have begun. As this field could hinder future energy production operations on Tallon IV, we must dismantle it as soon as possible. If this means the destruction of the Chozo Artifacts, it will be done. ^ a b Retro Studios (November 17, 2002). Metroid Prime. GameCube. Level/area: Tallon Overworld - Artifact Temple. Chozo Lore - "Binding": The congregation of Artifacts that hold the Great Poison at bay still hold strong. Fearful of the potential within the Artifact Temple, the invaders known as Space Pirates tried to destroy it, only to fail in every attempt. We scattered the Artifacts across the planet for their protection, and only a few have fallen into invader hands. Failing to understand them, they now seek to unmake them. Again, they fail. They are right to fear these things. Great power sleeps inside them. Prophecy calls for their union, come the day that the unholy Worm is met by the great Defender. We can only hope the Artifacts are not destroyed by the invader, for then all will be lost. So, we do what we can to preserve the Artifacts, and to guide the Newborn to them. ^ a b c d Michael, Bobby (June 29, 2003). "Metroid Prime Walkthrough". GameSpot. CBS Interactive. Archived from the original on October 8, 2015. Retrieved October 21, 2015. ^ Retro Studios (November 17, 2002). Metroid Prime. GameCube. Nintendo. Scene: Ending (100% items collected). ^ "Metroid Prime Roundtable QA". IGN. November 15, 2002. Archived from the original on December 12, 2012. Retrieved February 20, 2008. ^ "Yoshio Sakamoto discusses Metroid 64, Metroid Dread and the 3DS". GamesTM. Imagine Publishing (100). August 2010. ^ Varney, Allen (April 6, 2006). "Metroid Primed". The Escapist. Archived from the original on September 16, 2007. Retrieved September 16, 2007. ^ a b Casamassina, Matt (August 28, 2009). "A Space Bounty Hunter in Texas". IGN. Archived from the original on September 28, 2012. Retrieved April 28, 2010. ^ Wade, Kenneth Kyle (December 17, 2004). "A Retrospective: The Story of Retro Studios". N-sider. Archived from the original on January 8, 2009. Retrieved July 19, 2007. ^ IGN Staff (July 19, 2001). "Raven Blade Killed, Retro Lays off 26". IGN. Archived from the original on September 30, 2012. Retrieved December 25, 2010. ^ a b Kumar, Mathew; Leigh Alexander (November 27, 2007). "MIGS 2007: Retro Studios On The Journey Of Metroid Prime". Gamasutra. Archived from the original on November 29, 2007. Retrieved December 3, 2007. ^ "INTERVIEW: Retro Studios". Edge. December 26, 2007. Archived from the original on April 26, 2012. Retrieved January 27, 2008. ^ a b Totilo, Stephen (September 21, 2009). "Metroid Prime Team Discusses Their Decade Of Samus, Ponders Series' Future". Kotaku. Archived from the original on November 6, 2010. Retrieved March 23, 2011. ^ Wade, Kenneth Kyle (June 12, 2004). "Team Metroid Prime". N-sider. Archived from the original on October 3, 2012. Retrieved March 18, 2011. ^ "Metroid Prime development". N-sider. Archived from the original on February 28, 2008. Retrieved February 20, 2008. ^ IGN Staff (November 21, 2000). "Retro Inadvertently Confirms Metroid". IGN. Archived from the original on November 2, 2012. Retrieved July 25, 2011. ^ Fielder, Joe (May 17, 2001). "E3 2001: First look at Metroid Prime". GameSpot. Retrieved July 25, 2011. ^ "Interview with Metroid Prime 3: Corruption Sound Team at Retro Studios and Composer Kenji Yamamoto". Music4Games. October 5, 2007. Archived from the original on January 11, 2008. Retrieved January 27, 2008. ^ Tommy Tallarico. "www.tallarico.com — Metroid Prime". Archived from the original on March 17, 2012. Retrieved September 17, 2007. ^ IGN Staff (August 22, 2001). "Spaceworld 2001: Metroid Prime Progress Report". IGN. Archived from the original on November 9, 2012. Retrieved February 9, 2010. ^ "Metroid Prime & Fusion Original Soundtracks". Square Enix Music Online. Archived from the original on November 19, 2010. Retrieved October 10, 2015. ^ "Metroid Prime Related Games". GameSpot. CBS Interactive. Archived from the original on January 24, 2013. Retrieved November 13, 2012. ^ "Metroid Prime Release Date Revealed!". PALGN. January 28, 2003. Archived from the original on October 28, 2011. Retrieved August 9, 2009. ^ "Version Differences: Version Number". Metroid 2002. Archived from the original on November 24, 2015. Retrieved November 24, 2015. ^ "Metroid Prime 2 demo bundled with GameCube". GameSpot. August 4, 2004. Archived from the original on May 20, 2014. Retrieved March 29, 2015. ^ "Metroid Prime Bundle Announced". GameSpy. August 4, 2004. Archived from the original on May 11, 2015. Retrieved March 29, 2016. ^ Harris, Craig (February 20, 2009). "New Play Control Metroid Prime Hands-on". IGN. Archived from the original on November 6, 2012. Retrieved October 2, 2008. ^ Phillips, Tom (January 14, 2015). "Mario Galaxy 2, Metroid Prime Trilogy headed to Wii U eShop". Eurogamer. Gamer Network. Archived from the original on January 20, 2015. Retrieved January 14, 2015. ^ Otero, Jose (January 14, 2015). "Super Mario Galaxy 2, Metroid Prime Trilogy Coming to Wii U". IGN. Ziff Davis. Retrieved January 14, 2015. ^ Marriott, Scott Alan. "Metroid Prime - Review". AllGame. Archived from the original on December 11, 2014. Retrieved March 21, 2017. ^ "Metroid Prime review". Edge (115). November 15, 2002. ^ a b "Metroid Prime". Electronic Gaming Monthly (162): 184. January 2003. ^ a b Reiner, Andrew (January 2003). "Metroid Prime review". Game Informer. Game Informer (117): 98. Archived from the original on February 16, 2008. ^ "Metroid Prime". Nintendo Power (163): 210. December 2002. ^ "Best GameCube Game of 2002". IGN. January 17, 2003. Archived from the original on June 16, 2006. Retrieved March 27, 2007. ^ "2002 Overall Game of the Year". IGN. January 23, 2003. Archived from the original on June 19, 2015. Retrieved March 27, 2007. ^ "GameSpot's Best and Worst of 2002: Game of the Year". GameSpot. Archived from the original on February 7, 2003. Retrieved March 29, 2016. ^ "Game of the Year 2002". GameSpy. Archived from the original on May 25, 2011. Retrieved July 19, 2007. ^ "METROID PRIME TOPPLES GRAND THEFT AUTO: VICE CITY FOR ELECTRONIC GAMING MONTHLY'S "GAME OF THE YEAR AWARD"". Ziff Davis Media. March 5, 2003. Archived from the original on May 6, 2015. Retrieved July 19, 2009. ^ "Nintendo Power's Best of 2002". Nintendo Power (167). April 2003. ^ "Awards boost for Nintendo". BBC. April 26, 2003. Archived from the original on January 24, 2009. Retrieved July 19, 2009. ^ "6th Annual Interactive Achievement Awards". Academy of Interactive Arts & Sciences. Archived from the original on October 23, 2010. Retrieved October 21, 2010. ^ "3rd Annual Game Developers Choice Awards". Game Developers Conference. Archived from the original on October 23, 2010. Retrieved July 19, 2009. ^ Calvert, Justin (December 17, 2002). "November video game sales". GameSpot. Archived from the original on September 22, 2013. Retrieved April 27, 2004. ^ "Metroid Sales Hit Quarter Million Mark" (Press release). Nintendo of America. November 27, 2002. Archived from the original on June 29, 2011. Retrieved July 5, 2010. ^ Campbell, Colin; Joe Keiser (July 29, 2006). "The Top 100 Games of the 21st Century: 39–30". Next-gen.biz. Archived from the original on January 16, 2013. Retrieved October 22, 2007. ^ "New titles added to Nintendo GameCube Players Choice Range" (Press release). Nintendo of Europe. October 3, 2003. Archived from the original on September 24, 2015. Retrieved March 30, 2007. ^ Castro, Juan (April 29, 2005). "The Top Ten Best-Looking GameCube Games". IGN. Archived from the original on September 26, 2012. Retrieved September 16, 2007. ^ Reed, Kristan (March 21, 2003). "Metroid Prime review". Eurogamer. Archived from the original on February 17, 2009. Retrieved October 3, 2007. ^ "Game Rankings review". GameRankings. Archived from the original on January 3, 2004. Retrieved March 27, 2007. ^ "Entertainment Gaming Monthly reviews". 1UP.com. Archived from the original on March 25, 2015. Retrieved February 24, 2007. ^ Keighley, Geoff (November 22, 2002). "Space Craft". Entertainment Weekly. Archived from the original on October 23, 2007. Retrieved October 14, 2007. ^ "Review: Metroid Prime". GamePro. November 15, 2002. Archived from the original on November 30, 2011. Retrieved October 15, 2007. ^ "Best Console Graphics". Filter. Season 3. May 13, 2004. G4. ^ "IGN's top 100 games of all time". IGN. Archived from the original on February 4, 2012. Retrieved October 28, 2006. ^ "10-Year Anniversary Contest — The 10 Best Games Ever". GameFAQs. Archived from the original on July 16, 2015. Retrieved October 4, 2006. ^ "NP Top 200". Nintendo Power. 200: 63. February 2006. ^ "The Top 25 GameCube Games of All Time". IGN. March 16, 2007. Archived from the original on August 30, 2012. Retrieved September 13, 2007. ^ "Top 25 GameCube Games of All-Time - #3: Metroid Prime". GameSpy. August 12, 2005. Archived from the original on October 12, 2007. Retrieved September 13, 2007. ^ Kohler, Chris (December 24, 2009). "The 15 Most Influential Games of the Decade". Wired. Archived from the original on September 8, 2011. Retrieved September 10, 2011. ^ "Metroid Prime". Speed Demos Archive. January 1, 2003. Archived from the original on February 13, 2008. Retrieved February 20, 2008. ^ "Metroid Prime Pinball". Nintendo. Archived from the original on December 14, 2007. Retrieved July 19, 2007. ^ Colayco, Bob (March 23, 2006). "Metroid Prime HUnters Review". GameSpot. Archived from the original on August 11, 2015. Retrieved March 29, 2016. ^ Casamassina, Matt (August 3, 2005). "Metroid Prime 3 Details Emerge". IGN. Archived from the original on November 4, 2012. Retrieved March 30, 2007. ^ Webster, Andrew (June 13, 2017). "Metroid Prime 4 is coming to Nintendo Switch". The Verge. Archived from the original on June 25, 2017. Retrieved June 13, 2017. ^ Grubb, Jeff (June 13, 2017). "Retro Studios is not making Metroid Prime 4". Venture Beat. Archived from the original on June 13, 2017. Retrieved June 13, 2017. ^ Phillips, Tom (February 9, 2018). "Yes, Bandai Namco is working on Metroid Prime 4". Eurogamer. Gamer Network. Retrieved February 16, 2018. ^ Webster, Andrew (January 25, 2019). "Nintendo reboots Metroid Prime 4 development with new studio". The Verge. Vox Media. Archived from the original on January 25, 2019. Retrieved January 25, 2019. ^ "Frigate Orpheon". Nintendo/HAL Laboratory. December 18, 2007. Archived from the original on December 19, 2007. Retrieved December 18, 2007. ^ "First Songs in My Music". Nintendo/HAL Laboratory. January 29, 2008. Archived from the original on March 16, 2008. Retrieved March 19, 2008. ^ "Gamespy Geist interview". GameSpy. August 15, 2005. Archived from the original on January 31, 2008. Retrieved October 21, 2007. ^ Colayco, Bob (February 25, 2005). "Star Wars: Republic Commando Review". GameSpot. Archived from the original on November 4, 2013. Retrieved March 29, 2016.